The evening’s are lighter, there’s blossom on the trees and a spring in everyone’s step. Time to update you on Veg on the Edge and our progress! In January we received the report from the professionals who undertook our soil testing. At first reading it was a bit daunting. 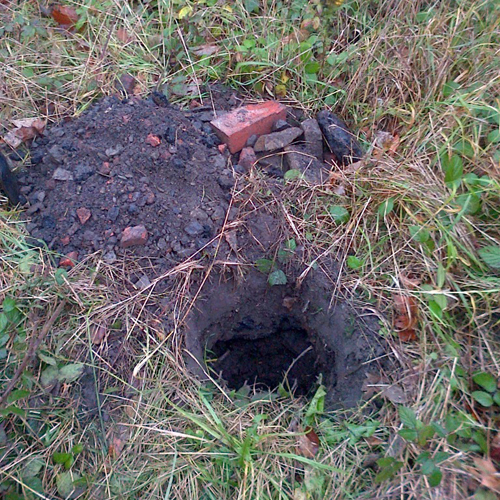 Trial pits on site revealed rather a large number of cobbles and stones – not very spade friendly, let alone veg-friendly – and the soil itself contained traces of ash, clinker, unwanted chemicals, and other nasties. Of course, this should be no surprise given the site’s chequered past as a former quarry, YWCA hostel, day nursery, and even (rumoured) an air-raid shelter. However, this presented us with the challenge of finding a way to ensure the food garden would be safe for all to use and grow. After extensive talks with the friendly people at Curtins (the company who carried out the soil testing), Bradford Community Environment Project (BCEP) and officers at Bradford Council, all of whom have all been incredibly helpful, we have come up with a plan. This is to cap the entire site with a super-durable geo-membrane and import clean, veg-friendly soil. This will then give us a long-lasting platform on which to create the community garden and make a safe environment in which to dig, work and play. The geo-membrane is estimated to last a minimum of a hundred years – plenty of time for us to harvest our rhubarb! This is not a job for amateurs, so the next task is to unearth suitable contractors who can undertake this work for us, and to assess the costs before we submit bids to fund the whole project. As you can imagine, until we resolved this challenge, we’ve had to slow down our progress in terms of seeking funding to make our vision happen. However, we’ve had very constructive initial discussions with our identified funder WREN . This is a not-for-profit business that awards grants for community, conservation and heritage projects. We are planning to submit a bid to WREN for the majority of our costs, together with a number of smaller bids to other trusts and foundations. We are now in the process of negotiating a lease with Bradford Council that will make us eligible to apply for this funding. This is where you come in! We are now looking for help with preparing our various bids for funding – and we’d prefer cash to magic beans. For those of you that have expressed an interest in supporting our funding endeavours, we will be in touch soon to invite you to a meeting to plan our next steps. If you think you might not be on this list, and have any experience of writing funding applications, securing sponsorship, preparing business plans or generally filling in forms, we would love to hear from you. Please contact Sarah at hello@vegontheedge.org to discuss how you could join our small-but-mighty taskforce. We have now gathered all your responses to the initial garden design presented at our Information Sharing Day back in October. Your views have been assimilated into a detailed materials specification and features brief, ready to go to BCEP to be transformed into the final Master Plan. Phew. There have been a few ups and downs over the past months but they have made us more determined than ever to make our project work, and create a green oasis for the people of Shipley and Saltaire to share. Stubborn, eh? Enjoy Spring and see you soon! This entry was posted in News on April 30, 2014 by Veg on the Edge.